This mountain is most easily accessed from the Hwy. E-134, crossing just south of Hardangervidda. The road connects Røldal on the west with Telemark in Eastern Norway. After exiting the main tunnel (Haukelitunellen) going east, drive about 2 kilometer. From the opposite direction, a good trailhead is about 4 kilometer west from the full serve tourist hut, Haukeliseter. The trailhead is named Midfjellsvollen on the map, there is a small (unplowed) road with a small bridge. A small turnout where 3 cars could park was available in winter 2014. This location is N59.84869, E007.12606, elevation about 980 meter. A larger area where one may park is located closer to the tunnel. Ski across the small bridge and climb gently uphill while keeping left. The goal is to enter Nupsdalen valley between Verjesteinsnuten and Store Nup. Ski up this valley and cross lake 1259, then ascend a bit more steeply at the end, keeping to the right hand side (which is obviously the best way up). There is a rock/cairn at the top showing way to this route. Descend a little, but stay right and try to not loose a lot ov elevation while heading north, do not fork right. The right slope to ascend is between tops 1549 and 1582. This connects nicely to lake 1469. Stay right and proceed across these lakes to the north end of lake 1460. From here, continue north on a slope that falls off to your left (west), gaining the plateau west of 1682. 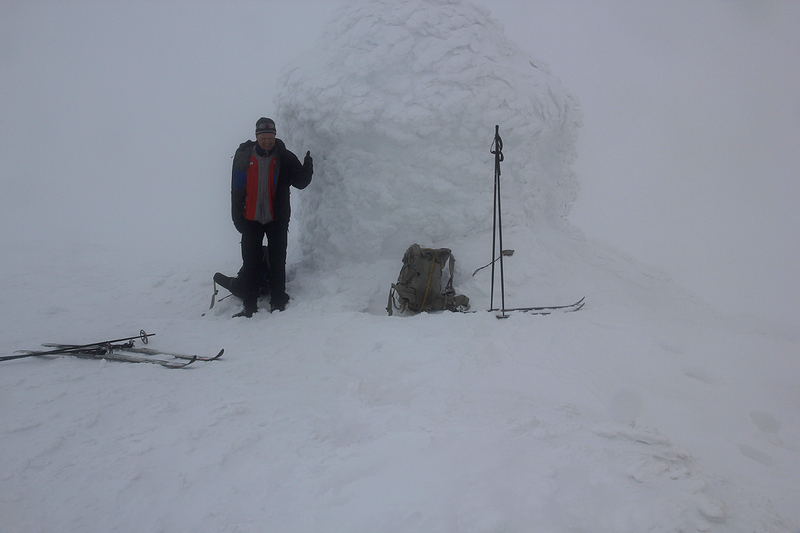 Continue to the saddle almost west of the summit, then ascend the final slope to find a very big cairn at the summit. I arrived at Haukeliseter around 2100 after a pretty good drive from Bergen. In the evening, I briefly talked to a man from Kongsberg on his way to visit a daugther in Bergen. Breakfast was at 0800 and there he approached me asking if he could join me on my planned ski trip to Sandfloegga. I told him that this would indeed be nice and so it was. We left Haukeliseter by car around 0900, located the small turnout and were ready to ski around 0915. It was very mild, overcast (contrary to the forecast), thus I started out with some violet wax with red in the middle, assuming that the snow would be more dry at higher elevations. My new companion, Jan Ole Landsverk, turned out to be in good shape and also a very capable skier. He was 54 years old and we set a good pace up the Nupsdalen valley. The somewhat steeper section at the upper end of the valley did not cause any problems and soon, we were on our way across the lakes that provide a natural passage to the foot of Sandfloegga. Unfortunately, the clouds touched the upper mountain and active use of my GPS was very helpful at the final 2 kilometer. 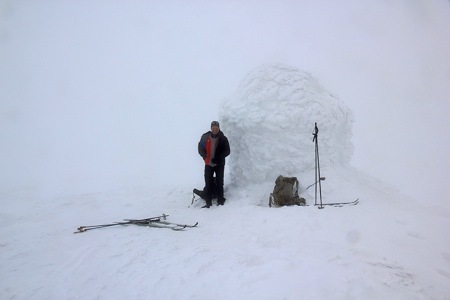 In fact, at 20 meter, we could still not see the cairn. Still, it was nice to arrive at this highest point of "vidda". The cairn had a visitor register as well as a thermometer that read exactly 0 Centigrade. We had arrived at 1315, so a 4 hour skitrip. We had a well deserved 15 minutes rest before starting our descent. The lack of visibility slowed us a bit initially. Thus, it was welcome to get back below the clouds and regain visual orientation. We were back at the road by 1615, a nice, 7 hour skitrip behind us. Many thanks to Jan Ole for very good company!